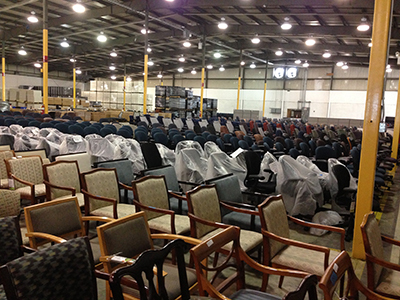 EthoSource, LLC has become a national leader in the field of office furniture liquidation. After scouring the country for the top brands and styles of office furniture, only the products of the highest quality are brought back from the liquidation to our warehouse. With about 100,000 square feet of warehouse space between our three locations, there is constantly new furniture being brought in and our inventory is always expanding to provide you more options. If a company is in need of the an office furniture liquidator to remove their existing furniture, we are capable of handling a project of any size. Whether you are moving, upgrading, downsizing, or simply redesigning, we are looking to buy your old office furniture. We have furniture options and styles from all different kinds of manufacturers and models, so you can find exactly what you’re looking for for your office. All the best furniture from a liquidation fills our warehouse, so everything you see is for a fraction of the cost of buying new. With locations in King of Prussia, Reading, and Morgantown, PA and over 55 employees, we have an endless selection and numerous possibilities for office furniture solutions that fit your specific needs. We work closely with our customers to find the furniture they are looking for to fit their company’s space. Our team of professional designers and project managers will also help you analyze and layout your building, so that all the furniture your team requires will fit your space with the look and feel you desire. Every project, no matter how big or small, will have a team built with one of our professionals from each department to ensure the project is taken care of from start to finish. With our refurbishing program, we can customize the furniture we bring back from liquidations to look and feel the way imagined, just as if you were selecting a new product. Choose from endless fabrics and finishes for chairs, cubicles, worksurfaces, etc. and mix and match used and new elements of your furniture to save you money and get your company valuable LEED points without sacrificing the quality of your new office. At EthoSource, we work hard to find the best names in furniture from around the country and bring it back to our corporate headquarters to remanufacture it and make it look like new. If you are in need of a nationwide liquidator or want high-end furniture at a great price, call EthoSource Office Furniture.